Perhaps you cannot find the exact model and configuration of a particular firearm that you want at a local retailer but you find it offered in a catalog from a store in another state, or maybe you have discovered that guns, like just about everything else these days, can be found at on-line merchants for better prices. Or maybe you are a collector who regularly peruses various on-line gun auctions. If you buy a from a non-local vendor making it necessary for the firearm to be shipped by common carrier (USPS, UPS, FedEx, etc) from somewhere else you must have the gun sent to a local FFL (Federal Firearm Licensee) to process the required background check and paper work and transfer the firearm to you. This is the process for ALL such gun purchases whether the firearm is new or used, whether purchased from a FFL dealer or non licensed person. I provide FFL transfer services, contacting your seller to provide them with a copy of my FFL and shipping address. Then, when the firearm is received I contact you to arrange a time for you to come in to complete the transfer process. 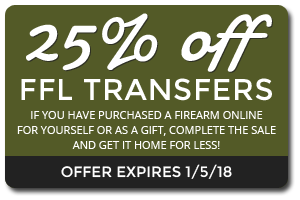 Unlike using a local gun store for FFL transfers where various employees and other customers are able to pay too much attention to your firearm purchases, I offer the privacy and convenience of a home based business so you can keep your private matters… private. I am registered with a number of on-line sites and vendors. If you don’t see me listed with your source simply tell them you will have your preferred FFL (Me!) provide them with all necessary information. Then contact me and give me the details of your purchase and I will make arrangements to have your firearm sent to me. It’s pretty simple really.